Tannin Riche, from Scott Laboratories, is a cellaring and finishing tannin used to add a rich oak character to your wines. This tannin lends notes of vanilla and coconut to wines, it can also add the perception of sweetness if your wine is in need of balance. Tannin Riche is a natural product made from 100% toasted French oak. In white wine, use 1/2 to 1 g per 5 gallons of wine. In red, use 1/2 to 3 g per 5 gallons. Mix the powder thoroughly with the wine during a racking. Add no later than 3 weeks before bottling. 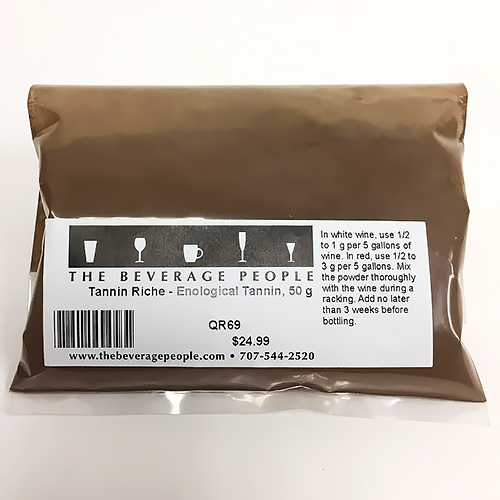 For more information and best practices, see the official Tannin Riche Product Page.